35 Marlborough was built ca. 1869, one of three contiguous houses (35-37-39 Marlborough) built at about the same time. 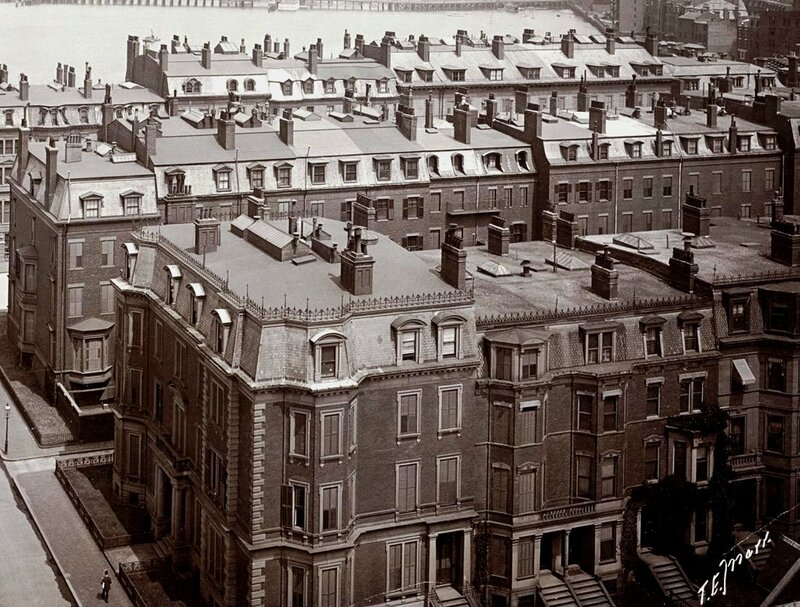 The land on which 35 Marlborough was built was part of a larger tract of land originally purchased from the Commonwealth of Massachusetts on November 6, 1858, by George Goss. He and his partner, Norman Carmine Munson, were the contractors responsible for filling the Commonwealth’s Back Bay lands. 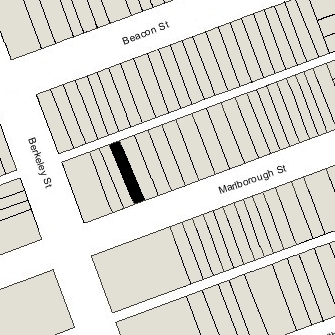 The original tract had a frontage of 421 feet and ran from where 9 Marlborough would be built west to Berkeley Street. On the same day he purchased the land, George Goss subdivided it into smaller parcels and sold them to several different buyers who then resold the land to others. Click here for an index to the deeds for 35 Marlborough. On March 30, 1869, the land for 35 Marlborough was purchased from Charles Freeland by Eliza Maria (Buckman) Newell, the wife of clothing merchant George A. Newell. They previously had lived at 40 Staniford. Their unmarried son, Edward Augustus Newell, a dry goods merchant, lived with them until about 1894, after which he made his home in Wilton, New Hampshire. On April 20, 1894, Eliza Newell transferred 35 Marlborough into her husband’s name. The Newells continued to live at 35 Marlborough until George Newell’s death in September of 1895. On November 12, 1895, 35 Marlborough was purchased from the estate of George Newell by Miss Katharine F. Holland, a dressmaker. Living with her were her brother-in-law and sister, James Lawrence Johnston and Ellen (Holland) Johnston. James Johnston was a liquor dealer. They all previously had lived in Dorchester. Also living with them was Florence Marie Treanor, the niece of Katharine Holland and Ellen (Holland) Johnston (the daughter of their sister, Annie, wife of Hugh Treanor). She married in January of 1904 to Edward Gibson Hynes, a physician from Brooklyn, New York. Katharine Holland and the Johnstons continued to live at 35 Marlborough during the 1904-1905 winter season, but moved thereafter. On July 14, 1905, 35 Marlborough was purchased from Katharine Holland by Thacher Loring. He and his wife, Margaret Fuller (Channing) Loring, made it their home. They previously had lived in Brookline. Thacher Loring was superintendent of the National Dock and Warehouse Company and, later, was treasurer of a trust company. 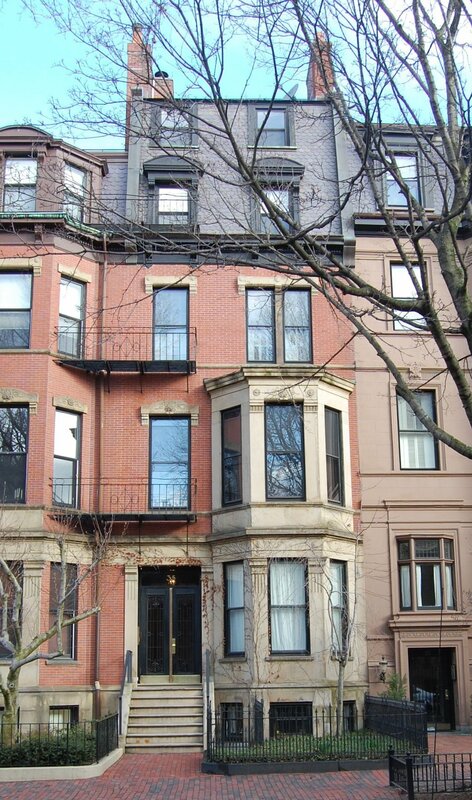 The Lorings continued to live in Brookline during the 1905-1906 winter season. It appears likely that it was at this time that 35 Marlborough was remodeled and a fifth story added. The Building Department records do not include a permit for this addition. However, the 1902 Bromley map shows the house with four stories, and the 1908 map shows it with five stories. From about 1922, the Lorings began spending their winters at the Hotel Victoria at 273 Dartmouth. On April 21, 1924, 35 Marlborough was purchased from Thacher Loring by banker Henry Parsons King, Jr. He and his wife, Mary (Parker) King, made it their home. They previously had lived at 247 Beacon. They also maintained a home in Prides Crossing. 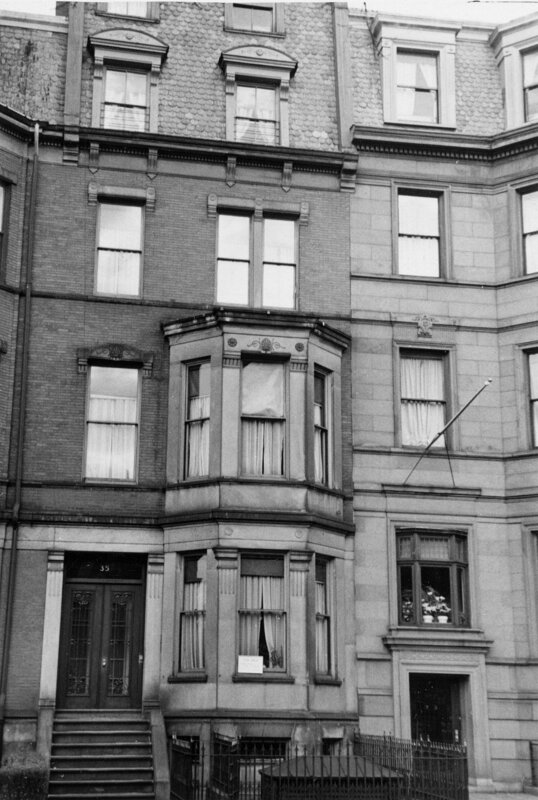 They continued to live at 35 Marlborough in mid-1930, when they moved to Jamaica Plain. On August 11, 1930, 35 Marlborough was purchased from Henry King by Harriet (Bayley) Long, the wife of stockbroker William Bowditch Long. They previously had lived at 6 West Cedar. They also maintained a home in Cohasset. The Longs continued to live at 35 Marlborough until about 1942, but had moved to 36 West Cedar by 1943. On June 15, 1942, 35 Marlborough was purchased from Harriet Long by Helen L. (Fairbanks) Lynde, wife of Charles Ripley Lynde, an importer of China and glass; they lived in Newtonville. On January 9, 1943, 35 Marlborough was acquired from Helen Lynde by Della Saul (Salinsky), the former wife of George Lapidus. She lived there with her son, Robert Jason (Lapidus) Saul, and her unmarried brother, Allen Payson Saul (Abraham Salinsky). They all previously had lived at 302 Beacon. Allen and Della Saul were chiropodists. Allen Saul also operated the Allen Payson Company, dealers in elastic stockings. In March of 1943, Della Saul filed for (and subsequently received) permission to convert the house from a single-family dwelling into a lodging house. Della Saul married again in 1944, to leather manufacturer Jacob Newman. After their marriage, they lived at 14 Buswell. Robert Saul iived with them. On August 7, 1944, Allen Saul acquired 35 Marlborough from his sister. On the same day, he also acquired 140 Beacon from her (she had purchased 140 Beacon in April of 1936, and she and her brother had converted it to apartments). Allen Saul continued to live at 35 Marlborough. Jacob and Della Saul separated in about 1951 and, by 1952, she and her son had moved to an apartment at 219 Beacon, a building which Allen Saul owned and had converted into apartments. In about 1953, Allen Saul moved from 35 Marlborough to an apartment at 140 Beacon. At about the same time, Della Saul moved there from 219 Beacon. Allen Saul continued to own 35 Marlborough and operate it as a lodging house. On August 1, 1985, 35 Marlborough was purchased from Allen Saul by Sheldon M. Stone, trustee of the First Block Real Estate Trust. In September of 1986, the trust applied for (and subsequently received) permission to convert the house into eleven apartments. 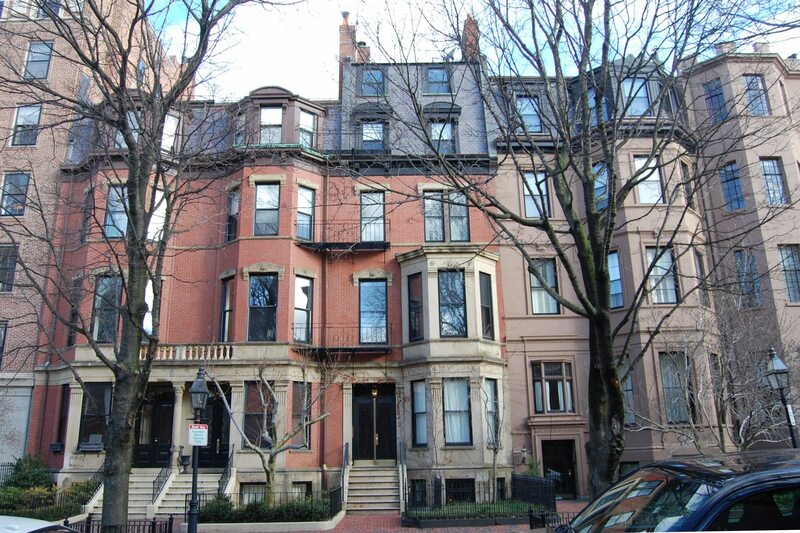 On March 12, 1987, the trust converted the apartments into eleven condominium units, the 35 Marlborough Street Condominium. In July of 1987, the trust applied for (and subsequently received) permission to reduce the number of units to seven and convert the rear ell into a four car garage. On January 21, 1992, the condominium association amended the master deed to reflect this change..